Inclinations was the second volume of writings by Stuart Morgan I edited, after working with him on What the Butler Saw (1996). It was substantially conceived in discussion with him before his untimely death in 2002, and together with the first it makes clear why he was 'widely regarded during the 1980s and early 1990s . 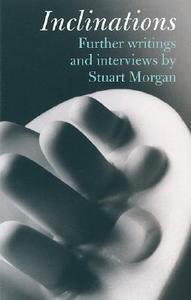 . . as the most significant British writer on contemporary art'. It includes some previously unpublished work (on Francis Bacon and Max Ophuls) alongside a wide-ranging selection of essays, interviews and reviews. My introduction sets out some biographical details and explains some of the contexts in which the writing was commissioned , and draws out two strands in particular in his thinking: his strong interest in performance, and his response to the changed atmosphere of art production in Europe and North America in the 1980s. With its inclusion of interviews with artists (at which Morgan excelled), and a range of writing that demonstrates his internationalism of outlook and independence of spirit, the book joins a small group of edited collections of art criticism from the period that questions the terms on which it was received.